"This publication deals with a manuscript, written by Philippe Couplet S.J., who was a missionary in China from 1658 till 1681. He was sent as a procurator of the Chinese missions to Europe, where he stayed till 1692. … It was during this time that he composed: A Brief Report of the Situation and Quality of the Missions in China. The present study contains an Italian transcript (pp. 40-96) and a facsimile edition (pp. 163-241) of this document. In an appendix, 316 Chinese works, presented by Couplet to Pope Innocent XI in 1685 and preserved in the Biblioteca Apostolica Vaticana, are listed (pp. 121-138). Gatta added an introduction and some conclusions. 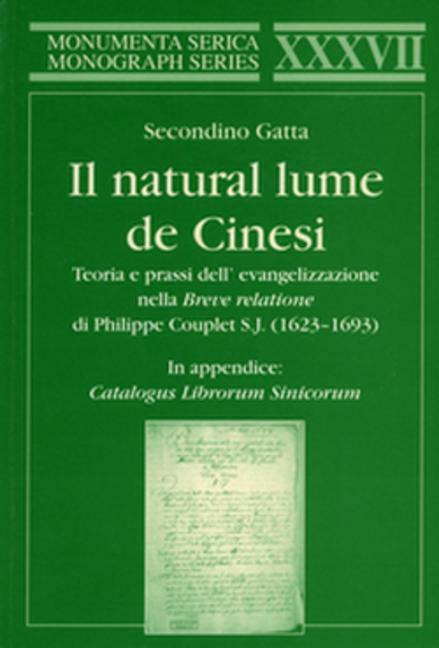 The Brief Report mentions in a nutshell all the main characteristics of the missionary approach of the Jesuits: evangelization from the top to the bottom, assimilation with the culture of the Confucians, the coincidence of the original Chinese and Christian notion of God and of the ethical norms, the accomodation to the rites of Confucianism, the negative relationship with Buddhism and Taoism, the importance of the study of astronomy and other sciences and the use of books published in Chinese. Both the mission of Couplet to Europe and his Brief Report have played a role in the Rites Controversy. The author of this book has to be thanked for this precious edition and commentary."